Hope this message finds you well. I wanted to share with you this photo my husband snapped of me as we entered the Labor & Delivery floor at our local hospital on Labor Day. 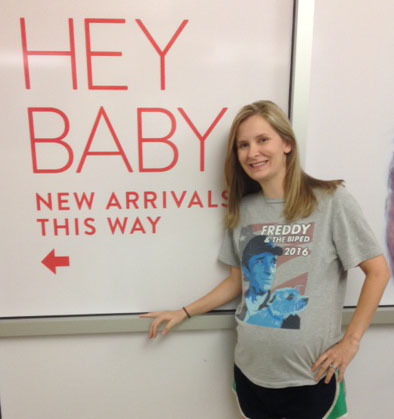 I assume a full term 9 month pregnant woman was probably not the target audience you hoped to wear these shirts. However, it’s been one of my favorites since receiving it as a Christmas gift last year. And I’m sure the comfort fit and fruit smoothies are the only reasons I survived the Alabama summer heat. Since it’s Friday, and since the Biped is back east impersonating someone famous, I thought I’d step in to congratulate you on the new pup, and offer you my permission to wrap the lad in swaddling clothes festooned with images of yours truly. I have no idea if my Human Butler will once again whore out my countenance to raise funds for his charity, but if he does, you’ll hear no real objection from me. Least I can do, considering he feeds me. However, I won’t pretend to understand the enduring fascination your species holds for clothing – especially for the pups. I’m as naked today as I was the day I was born, and my life is immeasurably better and simpler for it. With any luck, I’ll shuffle off my mortal coil years from now without ever knowing the humiliation or the suffocating clutch of fabric or fashion. Earlier this morning, the poodle next door walked by in some sort of unholy sweater-vest, and it was all I could do not to laugh in his face. Whatever – there’s no accounting for taste. I’ll ask His Majesty about future plans regarding his next sartorial foray, and report back forthwith. PS. If young Ford is in need of some extra pee-pads, I’m happy to send a few along. I no longer require them, mostly, and find them far more civilized than diapers.